This recording is of a morning concert at Ravi’s home on Highland Avenue in Hollywood, California in 1971 with George Harrison in attendance. As Ravi’s wife, Sukanya Shankar, attests in her amazing liner notes, this concert most certainly sowed the seeds for the overwhelmingly successful Concert for Bangladesh. The never-before-released recording was found in the deep shelves of the Ravi Shankar Archive and includes inspiring performances of Raga Vibhas, Raga Parameshwari, Dhun, and Raga Sindhi Bhairavi. With Alla Rakha on tabla and Kamala Chakravary on Tanpura, the music is a powerful mix of the ingenious modal scales, compositional elements, melodic forms, and improvisational phrasings that mark all Shankar recordings. But more than this, as the moment of origination for the Concert for Bangladesh, the recording is imbued with the heart and soul of the Maestro and his life-long commitment to the power of music to change the world. The recording has some timely synchronicities – it was recorded on the date that Ravi Shankar’s son-in-law, Joe Wright, was born, and its April release will honor of what would have been Ravi Shankar’s 96th birthday. This release is a great way to celebrate music culture and the Maestro’s legacy of Peace Through Music. Recorded live June 12, 1971 in Hollywood, California. Private concert at the home of Ravi Shankar on Highland Avenue. For those that love Ravi Shankar’s music, this two record and CD set is a treasure that contains music that will never get old and never lose its appeal. 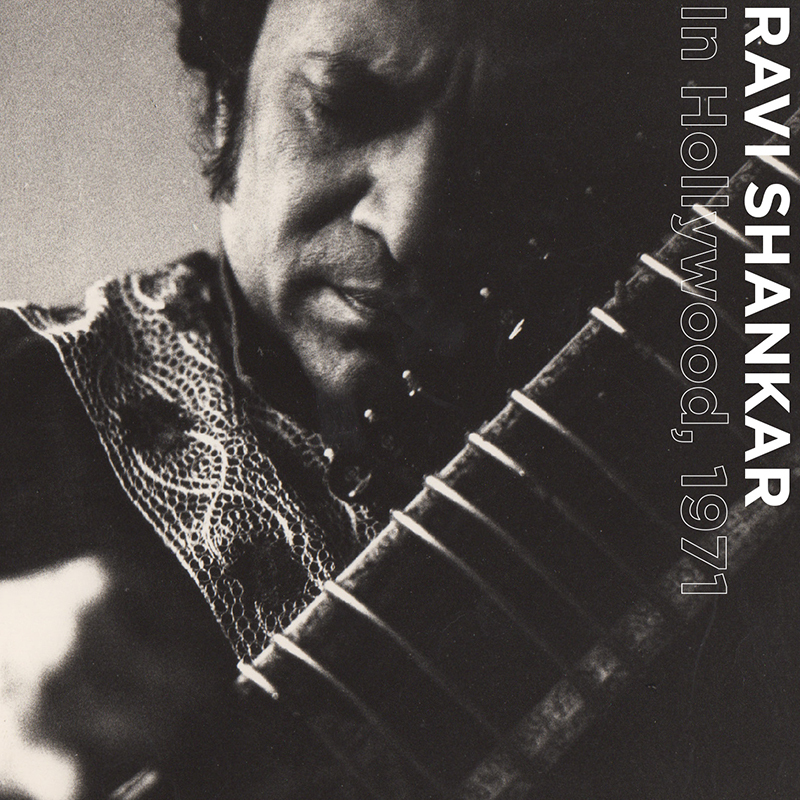 ‘In Hollywood 1971’ is a riveting and joyful journey through four unique ragas curated by one of the greatest musicians of the last century. Ravi Shankar’s music – along with that of Bach, Miles Davis, Hildegard Von Bingen and a few others – is part of the great human legacy and will survive long after anyone reading this has gone. It’s music that’s better than us. Better than anyone. We really aren’t worthy. …among the most accessible and passionate of Shankar’s recorded performances, and that it is an intimately recorded performance that brings you into the room with the sitar great, his frequent accompanist tabla player Ustad Alla Rakha and tanpura (a drone instrument) player Kamala Chakravarty.